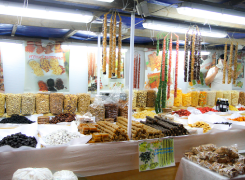 Panayiri is the Greek word for a village feast. 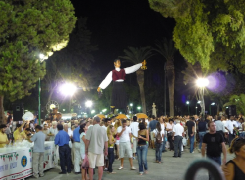 It is an event in which the whole village participates and enjoys thoroughly. Usually the name-days of Saints and other religious occasions were a welcomed excuse for setting up a "Panayiri". This takes place in a medieval castle ca. 15 min. driving time out of Limassol, exclusively rented for this event. The guests will be received by members of our staff (in appropriate dress in the style of the time, i.e. the waiters and the waitresses as soldiers and maids-of-honour respectively, and the cooks as Franciscan monks) with rosewater, holy incense and rose-petals. 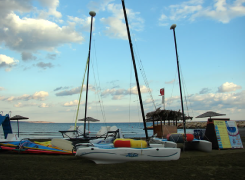 The group can spend an enjoyable day on the beach, enjoying a large variety of pre-arranged water sports. 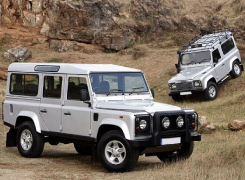 This is always a day of real fun, and has become very popular with our groups. This event takes us to the wine producing village of Omodhos on the Troodos mountains. This picturesque village built in the typical Cyprus mountain village style, will host the Wine Festival. 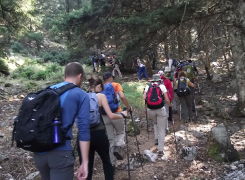 Departure for hiking and fresh mountain air in the Troodos Mountains. 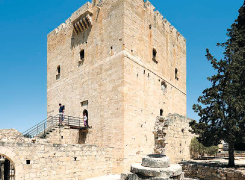 You may choose from 4 paths, specially marked out by the "Cyprus Tourism Organisation" for their beauty.